One usual weekend program for Berlin is to sit around in Görlitzer Park, drink beers and have talks with friends while enjoying the Summer breeze. There is a huge crater somewhere in the middle where we used to settle – it is a nice spot covered with grass, but it’s quite a mystery as well: how did it get there? Was it really a bomb during the wars as other Berlin expats say? Because today it’s raining cats and dogs out there and we don’t have the option to go out anyway, I finally had the time to do my research on the topic. Who knows? Maybe I can end those rumors completely, or, if there was a bomb, I can tell when and where it actually went off. 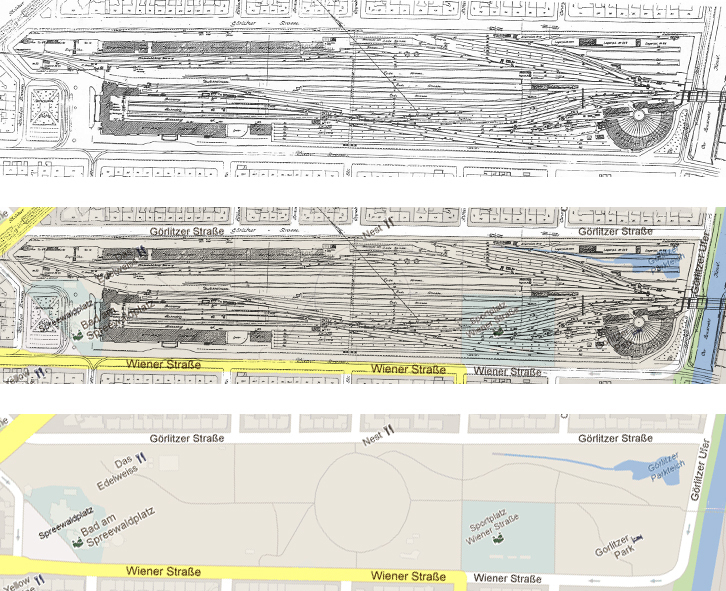 Well, the story starts with Görlitzer Park being a railway station before. The station in 1879, 1946, and people collecting wood in 1975, to use for heating their homes. Berliners are famous of reusing whatever they can – and traces of the railway station can still be found all over the park: some goods sheds and office buildings are used until this day, and there is a swimming bath built on the site of the former station. The old railway bridge offers a foot path to cross the Landwehrkanal and walk to Treptow. I wanted to know about the crater though, and at this point it could have been a service pit as well as something made by the rumored bomb. The Wikipedia article mentioned the Görlitzer Tunnel that was opened to the public in 1910 – an underpass, connecting Oppelner Strasse and Liegnitzer Strasse. Suits well: it’s right where the crater is – was it maybe bombed? The photo above shows the tunnel in 1989 in a rather good state, and according to the article the tunnel remained in use until the early 90s. When the area has been developed into the Görlitzer Park of today though, as soon as pedestrians had public access to the park, the tunnel became redundant – and later that decade it has been destroyed, creating the mysterious crater. No bombs from the World War involved.